Graphic artist Christine Park created this fascinating infographic that she gave us permission to share with you. 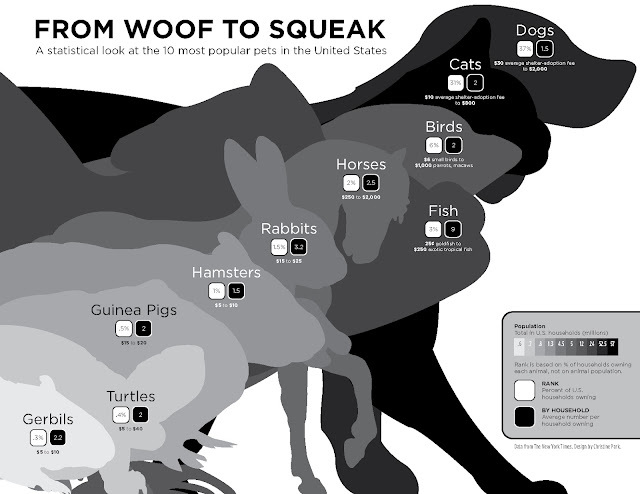 It's called "From Woof to Squeak" and it details the animals that are the top 10 most popular pets in the U.S. Thanks for letting us share this, Christine!! Wow we did not realise fish were so popular. Have a marvelous Monday. I think cats are the most popular!!! Wonderful! We were pleasantly surprised Turtles made it in the Top 10! Very cute name for the chart on our popularity in homes. Love her style...a fun way to capture that information too. That's very interesting! Thanks for sharing! Come on! Fish aren't pets; they're FOOD! Interesting, but we think kitties should be first. Wowwzers! Mommy has had alls of them!